Our take on a classic, and a quick hello! Hello Sweetpeas!! Sincerest apologies on my brief disappearence! We had some sudden family "stuff" to take care of, and it was nearly impossible to sit down to the PC for any length of time. I just wanted to drop a line to let you all know that I'll be an updating machine over the next few days! More holiday photos, fun mail photos, etc. We're also working on our new line for 2007 and during this stage of the design process it's hard to bounce from drawing board to computer. I promise to give you all first glimpses of each design as they are completed and listed! Up above is our newest creation!! 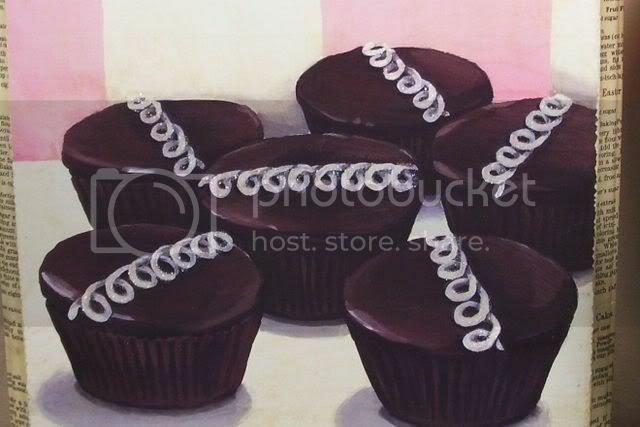 Jenny's Hostess cupcakes! After baking up a batch of these classic cuties for New Year's Eve.....We knew we had to have them sit and pose for us so we could capture them in painted portrait form. They are now listed and ready to ship! We hope you love them as much as we do!! I look forward to catching up with all of you tomorrow!! Hope you are having a fabulous New Year!! Jenny! 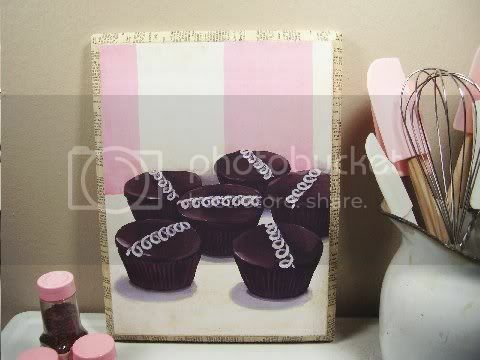 I'm so glad you created a new piece of artwork with your adorable cupcakes! Can't wait for the recipe. I also received my a-d-o-r-a-b-l-e artwork yesterday. I just love it! Thank you so much! I'll be sure and post on my blog with a link to your site. These look good enough to eat!!!!!!!!! Excellent work!! I want to reach out and eat one they look so real and yummy!!! Oooooooooh! They look incredible! Beautiful beautiful work! Thank you so so much for your sweet sweet words ladies!! I cannot thank you enough for visiting me! I'll be sure to stop on over and say hi at your blogs!